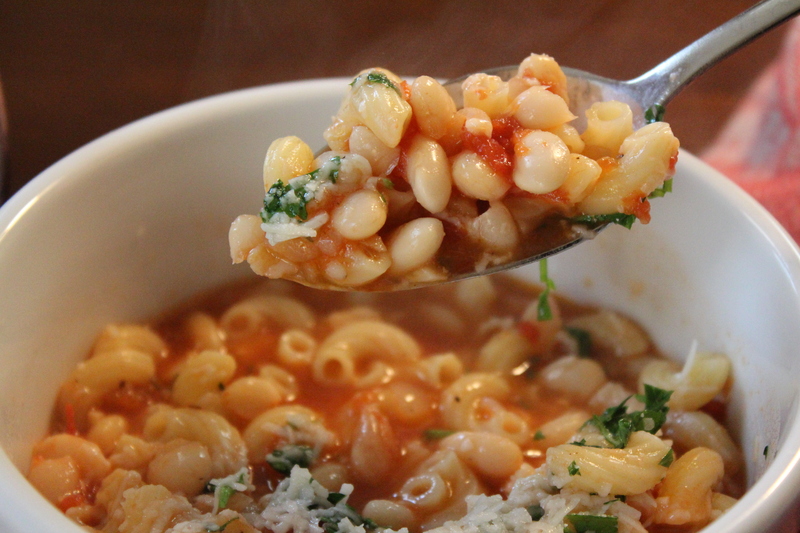 The most delicious soul-warming combination of beans, pasta and tomatoes in a simple but rich Parmesan, pepper-flecked broth. This dish is the reason that I started this blog. If I think of Nonnie in the kitchen, it generally involves her making pasta fazool and me being shooed away from the pot. “Elizabeth! Go. Out. Side!” To be sure, I know this is correctly referred to as pasta e fagioli (pasta and beans) but we have never called it that and I see no reason to start now. 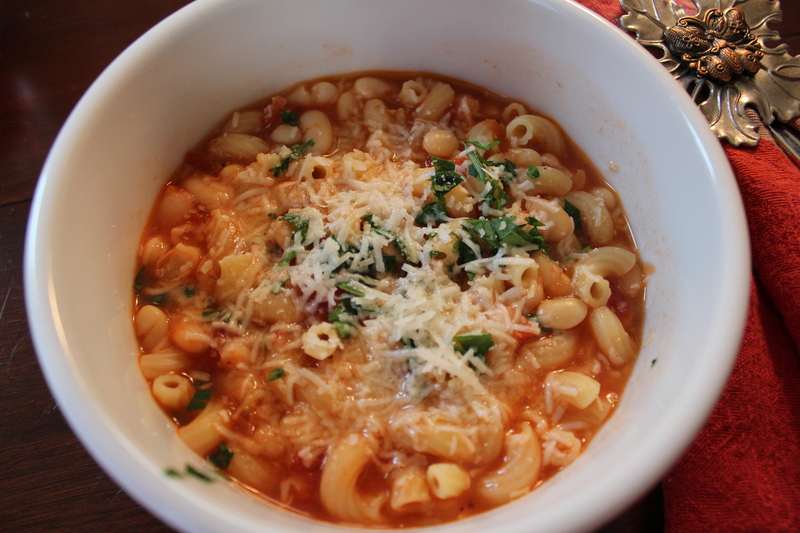 Plus, I don’t think most of the family would know what I was talking about if it I called it Nonnie’s pasta e fagioli. A bowl of this deliciousness could always set things straight … or at least make you forget your worries for a while. My best pasta fazool memory is after I had back surgery and was goofy on pain meds and not exactly feeling myself. Nonnie came over and found me lolling on the couch watching Ren & Stimpy and generally being out of sorts. She puttered back and forth between the kitchen and visiting with me and never once – and for this woman, it is amazing – mentioned that I should turn that idiotic trash on the television off lest my brain should rot and my morals be permanently damaged. Nope. She told stories. She puttered around … She made my house smell lovely and warm and left me with a fabulous memory. But no recipe! Nonnie’s version was (as is mine) meat-free. This dish was a staple for Fridays during Lent when meat was off the menu; and with the salty rich grated Parmesan on top, you never noticed anything might be missing. The downside of having Nonnie make this dish on command (or, more accurately, polite request) was that none of us ever got her recipe from her. Dementia and her eventual trip to the heavens took that possibility away for good a few years ago and thus began my quest. In my years-long search for a base recipe to work from, I finally found, and have borrowed liberally from (but do not blame), The New York Times version which was adapted from Emilio Vitolo, Emilio’s Ballato, Manhattan. Lineage in bean form! Here’s my step-by-step followed by the full recipe. Soak the beans overnight. In a pinch, you can do the boil-and-one-hour-soak that is described on every bag of beans, but I always find they split too early. That could, of course, be user error. Draining and rinsing before coking are imperative to get rid of the prospect of too many … bubbles. Moving on. Chop the garlic and onion … doesn’t have to be too finely … and saute in the olive oil over medium heat. You are looking for translucency and a heavenly aroma. Do not brown the aromatics. Place the beans into the pot with the onions and garlic and add water to two inches above the beans. This is not a point to get anxious about… just make sure the beans are covered with room to grow. And grow they will. Add the tomatoes and salt and give it all a stir. Bring to a boil. NOT PICTURED but a great treat: if you have any leftover rind of Parmigiano-Reggiano (never throw them away; they stay forever in the freezer), plop a piece or two into the pot now. Your frugality in saving rinds will be rewarded. Once it comes to a boil, reduce the heat to keep it at a low simmer uncovered (low on my gas burner) until the beans are done. See how one bean above (bottom rightish) has split? This is a pretty accurate indicator that the beans are done. If a majority have split, you’ve gone over a bit. You’ll still have a tasty meal but it won’t be exactly an al dente dish. When the beans are done cooking, cook the pasta in boiling salted water half the time called for. 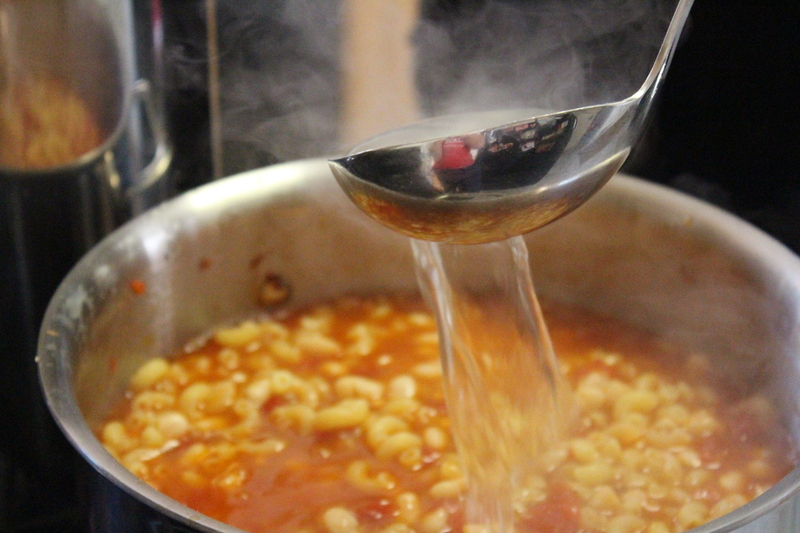 Put the half-cooked pasta in the beans and add some of the RESERVED pasta water to make it a soupy consistency. If it looks dry now, it will be arid when you serve it so be generous with the cooking liquid (see above). 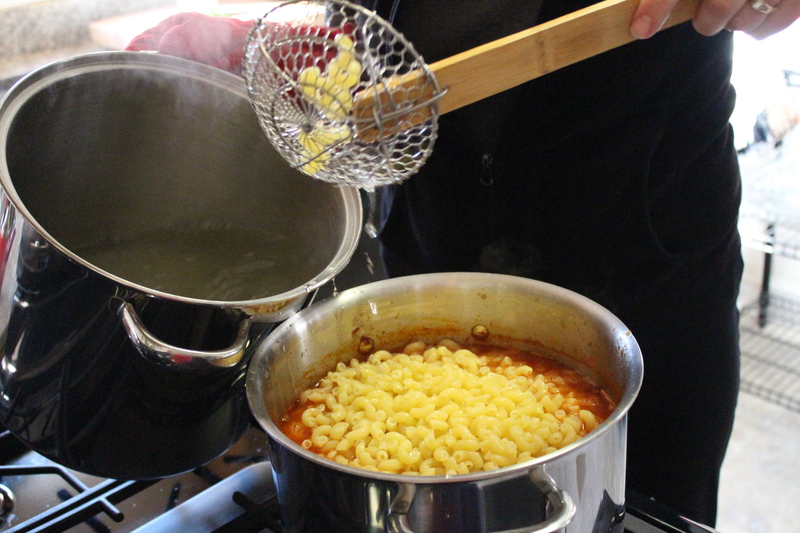 The half-cooked pasta will absorb a lot of the liquid when simmering with its legume brethren. Now is the time to add freshly ground pepper … and lots of it. I use 1 tbs. If this scares you, start with 1 tsp. Taste and adjust as you like. 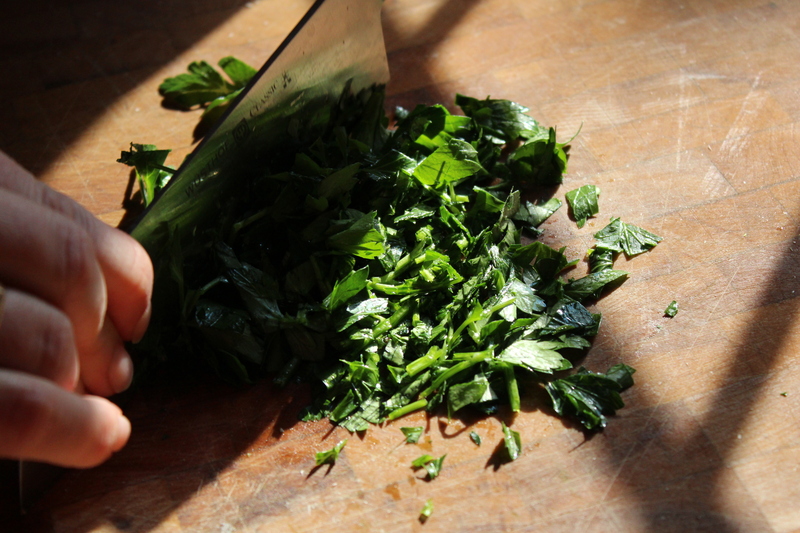 While the beans and pasta simmer, finely chop the parsley and grate the cheese. Please, for the love of all that is holy, do not use that mess in a green can. It is not cheese. It is something to be feared and avoided at all costs. I’ve added part of the chopped parsley to the pot. You can see how much water has been absorbed. 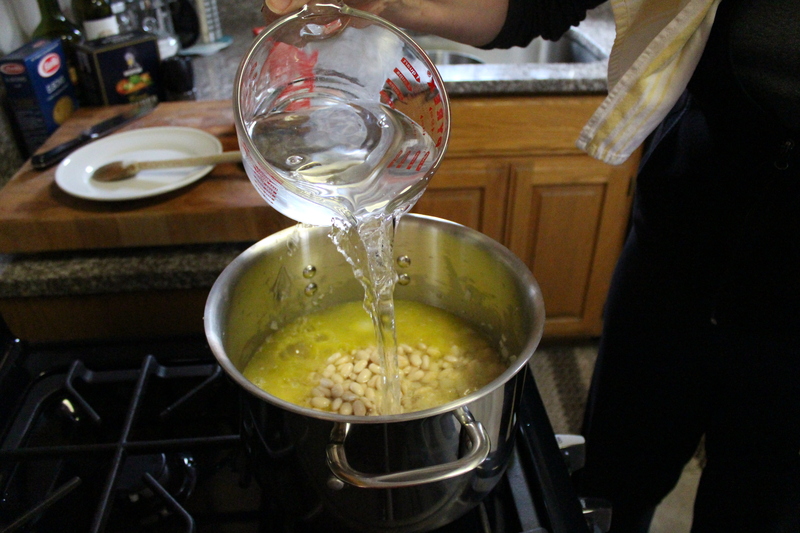 I added more of the reserved pasta cooking water before going on to …. This is the texture of the pasta fazool when served right away. 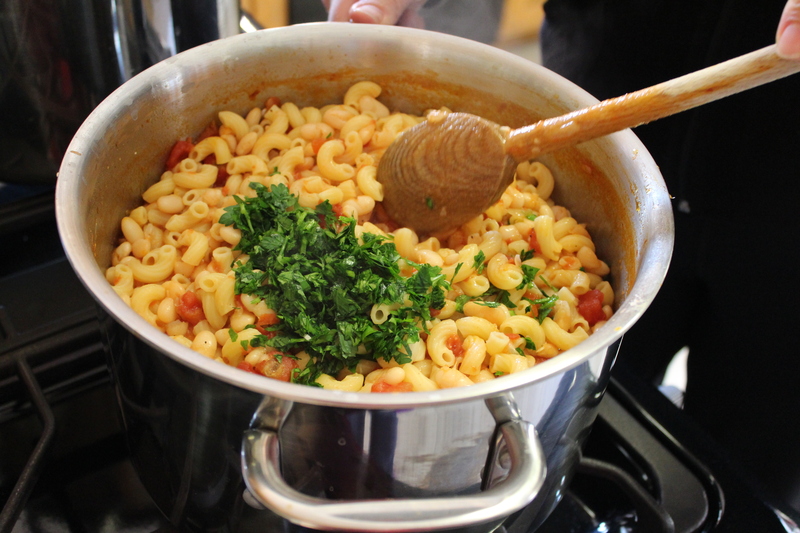 The next day, you will get less broth and a softer texture on the pasta. I like both! This recipe easily halves or (god love you) doubles. Enjoy! Time: Takes me 2 hours (mostly cooking time), plus overnight soaking of beans. 1. THE NIGHT BEFORE: Sort through the beans to be sure there are no pebbles or other random oddities and put into a soup pot. Cover the beans with water and soak overnight. 2. 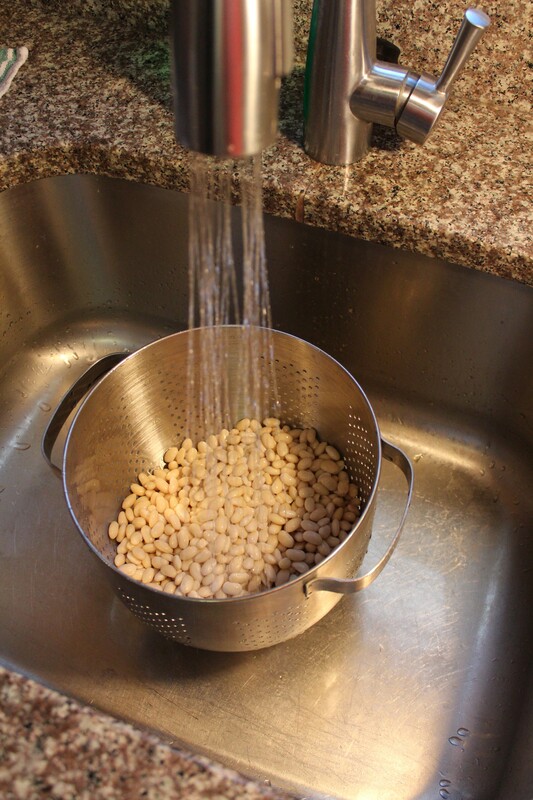 DAY OF: Drain and rinse the beans well in a colander. 3. Into the empty pot, pour the olive oil and saute the garlic and onion over medium heat until fragrant and opaque but not brown. 4. Place the beans into the pot with the onions and garlic and add water to two inches above the beans. Add the crushed or chopped tomatoes. Add 1 tbs. of salt. 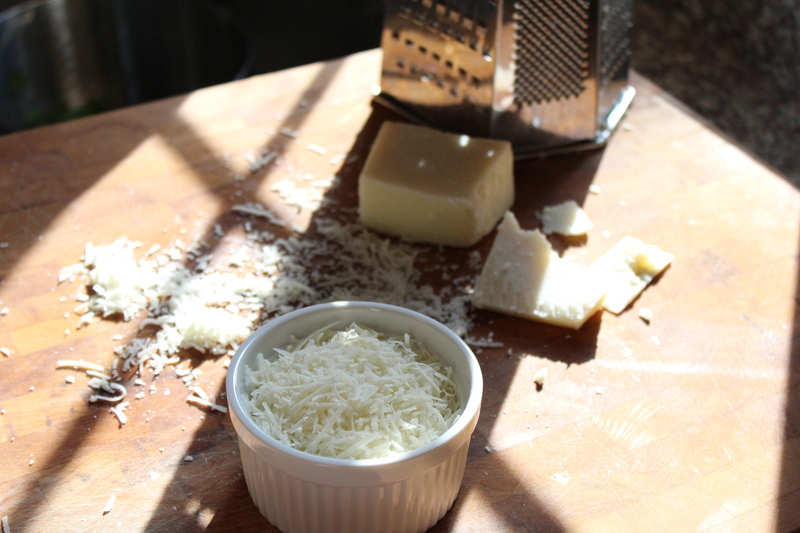 If you have a leftover rind of Parmigiano-Reggiano, plop that in now. 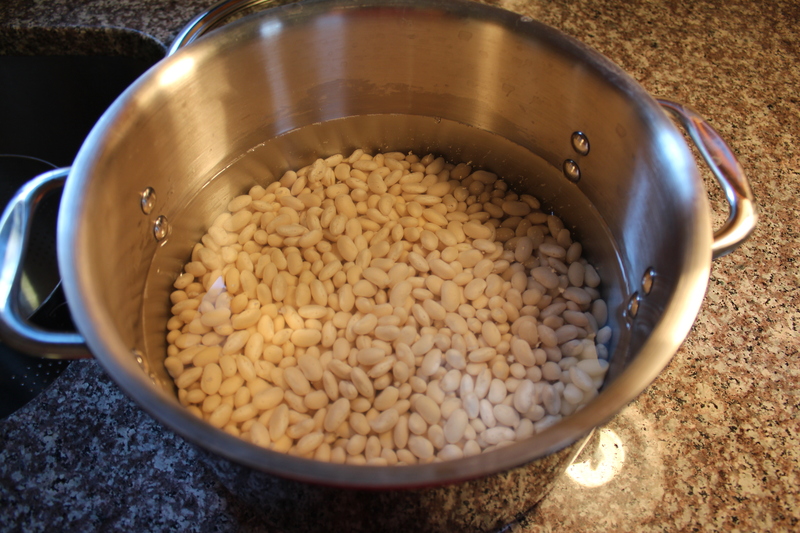 Bring to a boil, then reduce heat and simmer until the beans are tender, about 1 hour 20 minutes (though this can be longer or shorter depending on the beans … taste one for texture – should be creamy but not mushy; if they’ve started splitting, they are definitely done). 5. When the beans are done, turn off the burner and let the pot sit covered. Bring another large pot of salted water to a boil. Cook the pasta for only half the time called for on the box. 6. Drain the pasta and add it to the beans, reserving the cooking water. Add a generous amount of ground pepper – I use about 1 tbs. Turn the heat under the bean/pasta pot to medium and cook until the pasta is al dente, adding enough reserved pasta water to make a broth. 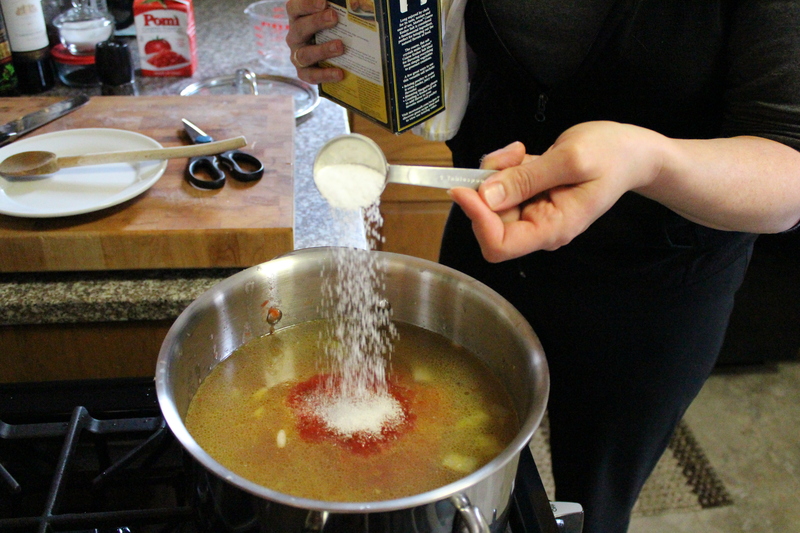 HINT: The soup will continue to thicken as it sits, especially if you are cooling it and serving the next day. I always make it a bit brothier than I think I want for that reason. 4. 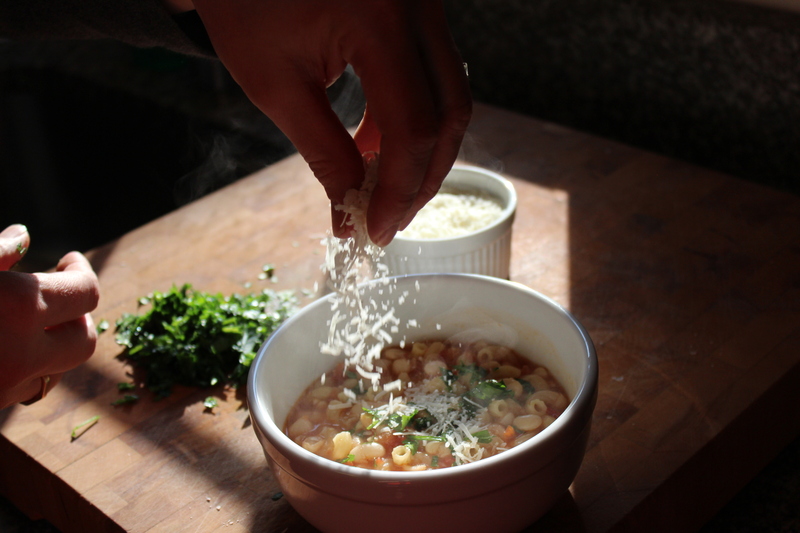 Ladle into bowls, garnish with a a bit of the chopped parsley and a sprinkling of the shredded cheese. Yield: Enough to feed at least 8 hungry folks, maybe more if you add a salad and bread. 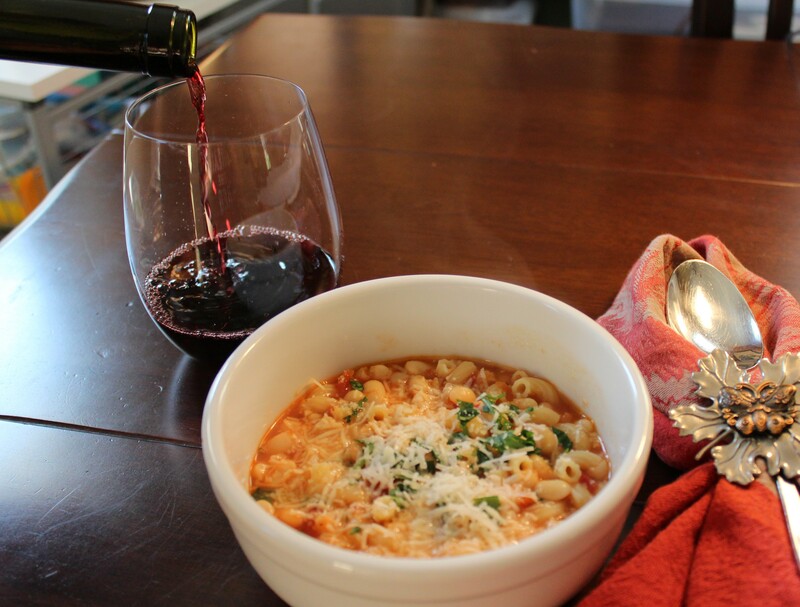 This entry was posted in Soups and tagged beans, famiily dinner, feed a crowd, Friday, healthy, Italian, Lent, Lenten meal, Make-Ahead, Nonnie, pasta, pasta e fagioli, slow food, soup, vegetarian. Bookmark the permalink.